Severe Thunderstorms Today In New Mexico & West Texas. Valid At Midnight Monday Night. 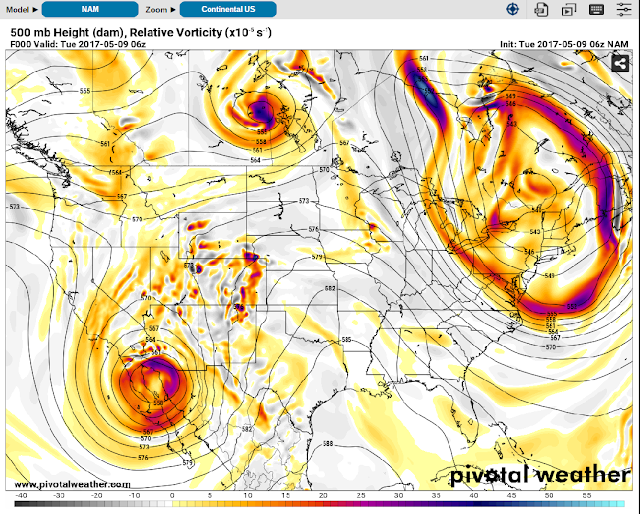 Model forecasts indicate that our potent cut off upper level low to our southwest will begin lifting northeastward today into Wednesday. Distribustances rotating northeastward around the base of the low will help destabilize the atmosphere over the area this afternoon and evening. 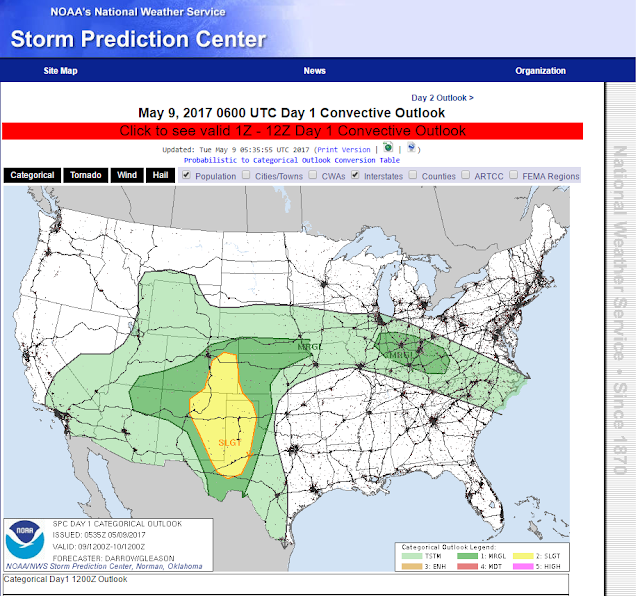 NWS Storm Prediction Center Severe Weather Outlook For Today. Severe thunderstorms are forecast over the area today. 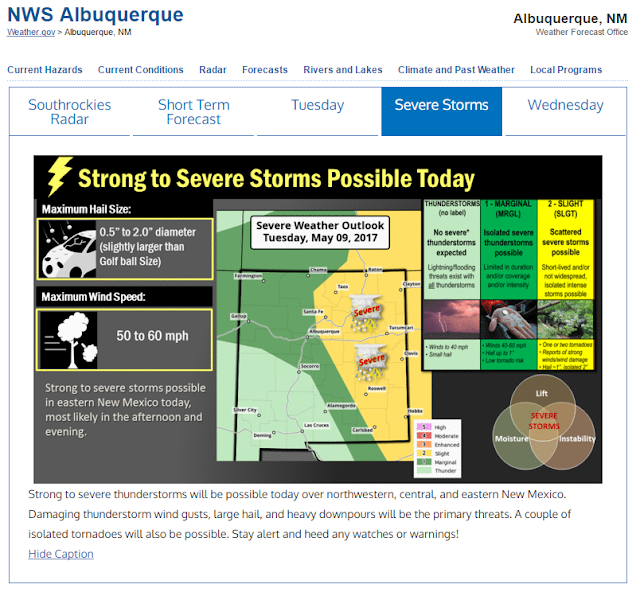 In fact severe thunderstorms may get an early start in Central and Northern New Mexico west of the Central Mountain chain later this morning. Some of these could be severe. See the NWS SPC discussion concerning this via this link. Large hail and damaging thunderstorm wind gusts will be the main threats early on. 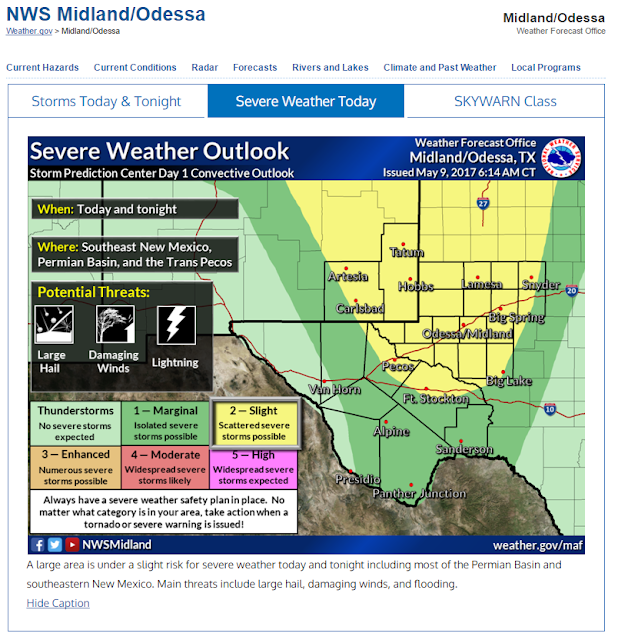 Later this afternoon and evening a more widespread and robust severe weather threat will exist east of the Central New Mexico Mountains eastward out onto the Northeastern, Eastern, and Southeastern Plains of the state. The severe weather will shift eastward into West Texas by tonight. Severe Thunderstorms In SE NM. A few severe thunderstorms developed across parts of Eddy and Chaves Counties Monday afternoon. Pea size hail was reported in northeastern Artesia and other locations in the Roswell area. Nickel to quarter size hail was reported in Roswell and in west Roswell the public reported slightly smaller than golf ball size hail. A cottonwood tree was blown down by strong thunderstorm winds west of Artesia. 0-6 KM Bulk Shear Values- 60+ knots. Surface Based Cape Values- 2,000+ j/kg. 300 MB 110 knot jet approaching from the SW.
Large hail some of which could be very large along with damaging thunderstorm wind gusts in excess of 60 mph will be the primary severe weather threats with any supercell thunderstorm that develops. Locally heavy rainfall will also be possible and could produce isolated instances of localized flash flooding. With the dryline mixing eastward this afternoon and then surging back westward around sunset my concern will be supercell thunderstorms that ignite along and east of the dryline. Around sunset 0-1 KM Storm Relative Helicity Values are forecast to be in the 250-300 m/s range so isolated tornadoes will also be possible.